Blur Busters Forums • View topic - QUICKSTART: Begin UltraHFR video making! QuickStart: What Do I Need For UltraHFR Video Making? Realtime UltraHFR (not slow-motion) playing full framerate on full high-Hz displays. More recent amateur-league UltraHFR experiments are occuring between a few people around here, online and offline. - Any recent CPU made in the last few years (i5, i7, Ryzen, etc). - A recent NVIDIA or AMD GPU, the fastest you can afford. - A recent SSD at >500 MBytes/sec. For faster, consider M.2 SSD slots on motherboard or PCI Express cards. - Computers capable of 4K60 can generally do up to 1080p240. - Computers capable of 8K60 can generally do up to 1080p960. - For displaying the files in a compatible workflow, you are currently limited to 4K120Hz, or 1080p240Hz, or 540p480Hz. - Cheap 240fps UltraHFR: A basic midrange NVIDIA/Radeon GPU. - Cream-of-crop UltraHFR: GTX 1080Ti or GTX Titan X Black+ on recent i7/Ryzen and Samsung 960Pro M.2 SSD or 970Pro M.2 SSD. 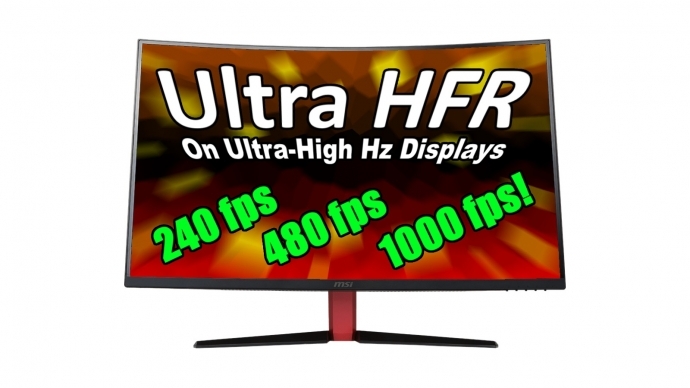 - Basic UltraHFR displays are surprisingly not too expensive, 240Hz costs under $500 and 480Hz costs under $1000. NOTE: We have found frame pacing precision is usually the video player's author fault. Sub-millisecond-accurate framepacing is absolutely essential to round-off played frames to the refresh cycles correctly. Millisecond-accurate framepacing is too low-resolution for 480Hz (frames are only 2ms, so 1ms rounding errors will often miss refresh cycles and create random-pulldown like 0:1:2:0:1:2:0:1:2 instead of correct 1:1:1:1:1:1:1:1 perfect frame:Hz sync). The conclusion is PLEASE use things like RTDSC or QueryPerformanceCounter() or std::chrono::high_resolution_clock::now() instead of old fashioned millisecond clocks, for software developers writing open source video players. Submit appropriate BugZilla ticket reports where applicable. - Blender works with UltraHFR!! It can speed slo-mo camera videos to 240fps and 480fps. Audio is preservable on some cameras (e.g. Hallelujah!!! - Very few compatible workflows yet. For source engine videos, you can use "makemovie" -- that can "screenshot-every-frame" (using SSD or SSD RAID) -- it is possible to create true 480fps gameplay video files using Half Life engined games. Many SSDs including Samsung 960 Pro M.2 SSD seems to have no problems keeping up with 480 screenshots per second (960 files written to disk per second). - If you have lots of money, Phantom Flex cameras also work. However, most amateurs cannot afford them. You can use multiple separate GoPro cameras to record higher framerates -- e.g. two 240fps GoPros recording simultaneously to generate 480fps video files, see How to use two 240fps GoPros simultaneously to create true-480fps video. If you need to purchase UltraHFR compatible cameras, please support Blur Busters via using these links. To share to others, you must share video files natively (e.g. links to .MP4 files). Cloud services work, such as 1TB Dropbox or GoogleDrive accounts. Doing YouTube/Vimeo won't work. Must be an .MP4 file download. Embedded .MP4 playback will however work in Google Chrome (up to 240fps), but .MP4 downloads are recommended, and generally recommending users to use MPV player because it is the most reliable UltraHFR capable video player at the moment. Re: QUICKSTART: Begin UltraHFR video making! NCH Video Pad Video Editor is also another program I used and use for Ultra HFR video. Video Pad can export videos at 1000fps. The 'Detect..' tab can detect any frame rate but can save videos up to 1000fps. Blender 2.79 can now save any frame rate you throw at it*! I'm aiming for 1920fps now, but blender can save as high as 12000fps or higher! !